As soon as I saw the Knights of Casterly Rock figures, I knew that I wanted to try some special freehand effects on them! Between the finely sculpted horses and the perfectly cast weapons, that task would be made much easier than usual for Cavalry figures. Normally you have to go through the process of gluing together 2 halves of the horse, sticking the head and tail in between them as you get glue and green stuff all over your fingers. Not so here, because all you have to do it take the assembled figs out of the box, file a few mould lines... and start painting! I have seen these painted in the usual red several times, but I thought I would add a few elements, such as filigree, lions, and even a certain Lannister's face :-) This series of views gives you a good look at all three. When it comes to the cloak, I did the same pattern which I painted on the Guard Captain. 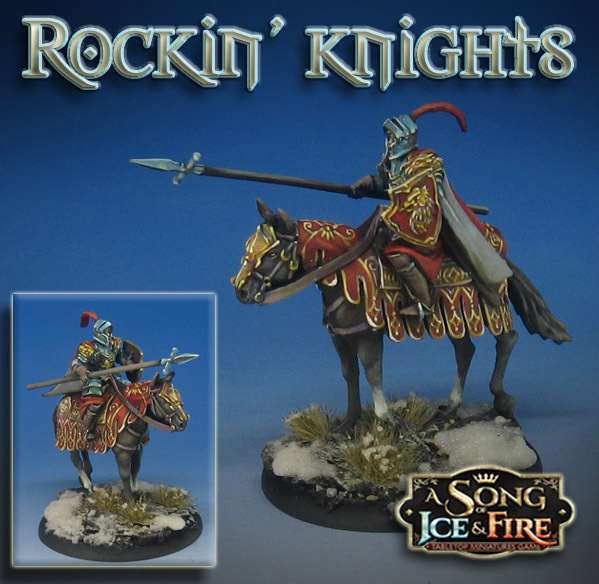 He is just one of the figures which was part of the Army Painting tutorial series I created using the Lannister Halberds. I also did the same Sky-Earth Non Metallic Metal technique on this. There was a little more gold on the cavalry figure, so I also had some fun working with that. This was the "color test" figure for another tutorial that I will be making for the Patreon Page, which will take you through that process of elaborate freehand. The idea is to show you how to break down something that looks incredibly complex into something more manageable! I can't count how many times I have heard folks say that they don't want to attempt freehand because it is too difficult. Hopefully the videos I have been creating are changing that!! Amazing work as usual. You rule my friend. A beautiful red tone, excellent. Thanks! The Lannisters certainly have a classic red!